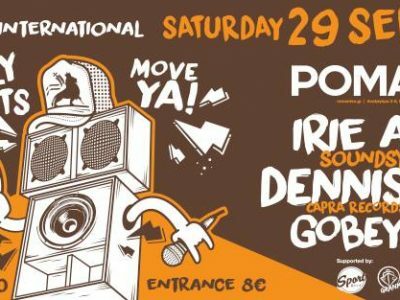 IRIE Action Sound System, based in Athens, is the first Roots Reggae / Dub Sound System in Greece. In 2005 Oldjohn through their love of reggae music and drawing inspiration from the Jamaican sound system culture, created the Irie Action Sound System. An independent 16,000 watt/rms handcrafted sound system, the purpose of which is to play in every city all over Greece, transmitting the message and the vibe of reggae music. For them, reggae music has become a mission … and their mission is to provoke positive feelings in action. Irie Action Music Record Label has made two releases. The first in 2009 titled «Love Inna Pollution» (12 «Inches) with Ranking Joe, Ranking Trevor, Oldjohn, Fitta Warri and the second in 2010 (10 » Inches) with Earl Zero, Ranking Forrest at “Zion March” and Oldjohn at “No Real Rebel”. A third release is expected to take place at the end of 2018. Creates an eternal sound made for people who can’t stop dancing to Jah music. In 2005, Dennis Capra started his musical career in Naples, Italy. After a few years in the sound system business, the first studio of Capra Records was based in Bologna in 2010. In 2012 was out the first release of a independent record label called Capra, influenced by the 70’s and 80’s Jamaican Roots Reggae Sounds. In 2015 the studio of Capra Records moved again, this time to Spain, before in Barcelona and then in Valencia, where was born the first sub-label which is more oriented around contemporary dub and digital sounds. Since 2017, Capra Records it’s a company along with Dennis Capra and Michal Krygiel and it has become a worldwide label distribution, a recording and mixing studio and a record shop based in Valencia, Spain. Specialize in supporting and promoting new talents, promote with its sub labels all styles of Reggae Music with an authentic flavor. As a duo, they have released a single-music video on the worldwide known german reggae magazine, Reggaeville, called «Trust» with great feedback and another single called «Music Has No Borders». This tune features Jorge, an upcoming greek artist. Currently, they are working a tune with the popular greek producer Kill Emil which will be included in Kill Emil’s 2018 album release. Since they were looking for a new way to express themselves musically, spiritually and due to their inclination to be a part of a musical team, they came up with the idea to form Gobey & P-Gial 5 membered band. Sharing the same vision and the high purpose of light Gobey & P-Gial band released their first full length album called «Dreadrock» independently on April 2018. This album features MC Yinka Terrone and Christos DC from the USA.